The key to going beyond making efforts on a mental and external level to manage the areas of your life is to understand the ten modalities of the life-force (Qi) that is behind each of the five fundamental areas of your life. In this manner you can manage your energies that are the sources of your life talents—the way you think, your creativity, your ability to attract the friends, assistance and opportunities for success. The Bazi astrology system will also show you which organ systems are stressed by the various challenges in your life to enable you to avoid success at the expense of your well being, and to achieve success by boosting the vitality of the specific organ energy system that is in control of a specific life arena. If for example, acquiring resources (education, support, etc.) 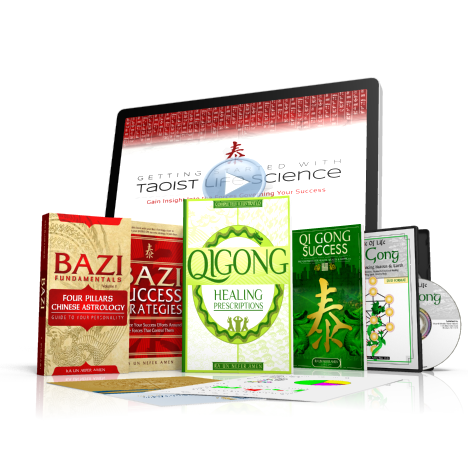 is critical to success in your life projects, and the Bazi chart shows that the energy that is responsible for your ability to attract resources is low, you will be able to boost this energy through Qi Gong, nutritional herbal supplements, acupuncture, etc. You could take a course to increase your knowledge in the field you are working in, but that approach will do nothing for awakening or increasing your learning ability or inner power to attract the specific help you need. Our Taoist Life science system will help you 1) attract friends and side step opponents, 2) achieve optimum creativity and productivity, 3) to optimize you accumulation of wealth, 4) to attain to the highest level of status in the family, job, and society and 5) to improve and optimize your ability to learn (from outside and intuitively) and to attract the information and educational resources (information and mentors) for your life’s projects.